it's not mine but the shape really looks like what I always made. My previous holiday which I spent mostly at my beloved home, were somewhat relieving. It's been awhile to be there for about more than two weeks. I decided to do more things that couldn't be done since I spent most of my time in Bandung. Apparently, cooking was the most suitable choice. The first thing I made was PIZZA. I lost my recipe, but I got a more simple one. Even I remember it now. This recipe is for 3-4 medium size of pizza. You only need to mix all of it, knead 'em, cover it for an hour. Then punch it down, and let it rise for more an hour. Then, the dough is ready to use. Don't forget to grease the baking pan. 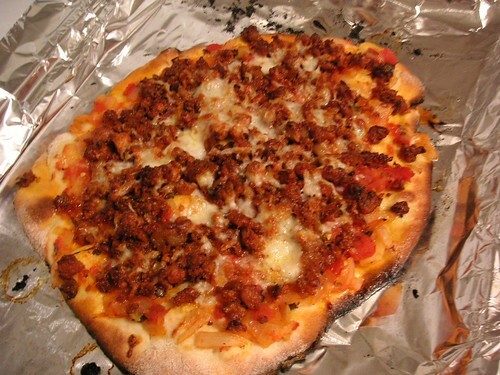 Put some toppings, then put in the oven for about 10-15 minutes, varies on the pizza size and the oven's heat. Just take it out when you feel like it. For more variations, you could make a pizza with chocolate topping, nuts topping, and whatever you have in your kitchen. Sprinkle grated K*aft quick melt on your toppings since it's easier to find than parmesan cheese.